You can export your data at any time! Just log into the DealMachine website at DealMachineApp.com. Once you login with your username, you simply go to settings, and hit export. We have 4 export options that makes it easy to import anywhere. "Export All Deals" is the most popular. It exports one row for each deal. 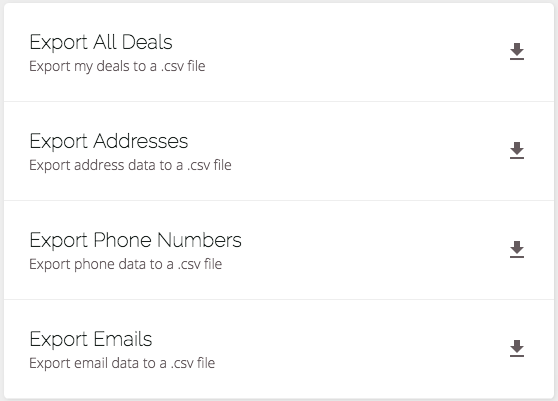 Additional phones, mailing addresses, and emails are added as columns. The following 3 buttons for Addresses, Numbers, and Emails gives you a slightly different format. These produce 1 row for each mailing address, number, or email. Click any of the export buttons and you'll instantly download a .CSV file with all the information for each of the properties and contacts inside your DealMachine system.